As the economy is transforming and upgrading, innovation breakthrough is an engine. On the 3rd Member Representative Conference of New Wall Materials Industry Association lately held in Fujian, the horn of wall materials innovation and ecological strategy is blown again. On the conference, Fu Junyuan, Chairman of Quanzhou Sanlian Machinery Manufacture Co., Ltd., was honored appointed as Vice President of the 3rd Session of the Council. 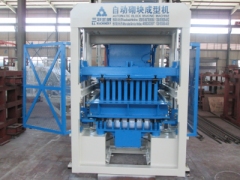 It is a recognition for Quanzhou Sanlian Machinery to spare no efforts to New Wall Materials for years in China. Environmental protection pains for the moment and gains for the millennia. When the building industry began to focus on "Green Environmental Protection", Quanzhou Sanlian Machinery has devoted themselves 6 years to developing building energy saving new wall material "insulated foam concrete block for exterior wall”. If you know it was born of a high-tech product after a series of tests and thousands of formula study, you must be curious about what kind of magic about it. Light and heat preservation is its inherent characteristic. The lowest dry apparent density of the insulated foam concrete block is about 500 kg/m3, the strength at least 3.5 Mpa. The material is nearly 50% lighter than ordinary bricks. It can reduce the weight of the building, also ease the pressure on the foundation of the building, to save the size of the beam structure and the cost of engineering. There are a billion of cellular closed foam pores in bricks per cubic meter, to make it more excellent thermal insulation than general exterior wall material in the market. 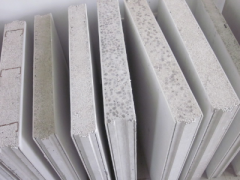 At the same time, the minimum water absorption of these independent closed foam pores is 10% or less, in this way which can protect the exterior block walls from easy cracks, in order to ensure the construction lifelong heat preservation and the quality. Despite the above features, it is a significant innovation, but in the consciousness of Quanzhou Sanlian Machinery, it is far from enough. Then, in the subsequent trial, they have fire prevention test, and finally they confirmed the formula to produce the insulated foam concrete block as completely non-combustible material, whose fireproof limit can reach more than two hours, with A level fireproof standard. After the birth of the new scientific research achievements, Quanzhou Sanlian Machinery started a brand new innovation, without tasting the joy of success from hard work yet. In the face of daily ten thousand tons of urban construction waste, residue from municipal pipeline, road and subway construction, solid waste with industrial production, eroding our environment, Quanzhou Sanlian Machinery has accelerated the research of turning industrial waste residue into valuable. 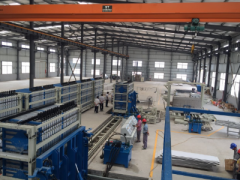 As a enterprise specialized in the production of wall and brick machinery, Quanzhou Sanlian Machinery took the lead in research of "building residues regenerated brick automatic production line", at the meantime of research and development of new environmental wall materials formula. It can avoid burning of mud content 90% of building residues, to make a major technical breakthrough of implementation in the treatment of urban solid waste. After heavy rains every time, the domestic numerous city in flood, the Central Government proposed to build a "Sponge City" urban ecological strategy. 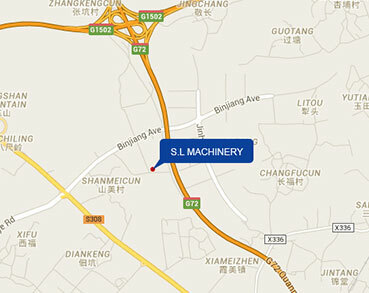 Quanzhou Sanlian Machinery became the industry leader again, already spending ten years sending the outstanding technicians to the Netherlands and the United States for investigation and study, combining each advanced production formula, by continuous research and experiment. Regarding the formula of water permeable brick, it has proved better permeability and higher strength. To say No to urban waterlogging. With all efforts and countless achievements, Quanzhou Sanlian Machinery reveals a truth by its own actions, which is “Innovation is endless, but never stops”. When we say goodbye to "Twelfth Five-year Plan" with full of golden harvest, in the face of a great expectation "Thirteenth Five-year Plan", green development has become the main stream of the development of era by the revolution of new wall materials and construction of ecological strategy. 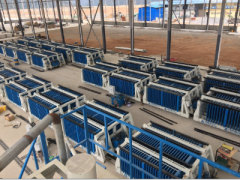 Sanding on the new high level, Quanzhou Sanlian Machinery is aimed to win the market competition in the tide, in order to "create first-class satisfactory service for customers" as own duty, ready to make a new breakthrough, and efforts to create new achievements again.